PHUKET: THE seventh annual Run Paradise Laguna Phuket International Marathon (LPIM) took place in the early morning hours of Sunday, June 10, with over four thousand participants of varying ability taking part. The event, sponsored by the Phuket Gazette, was divided into five categories: the grueling full marathon of 42 kilometers; the half marathon of 21km; the 10.5km run; the 5km community walk and a 2km children’s run. Participants ranged from as young as 16 years to some who can claim the title of octogenarian. One couple, Somsak Kaiswong and his wife Yindee, 78 and 73 respectively, have completed over 80 marathons between them. Some participants wore costumes, the most prominent of which was Trent Morrow’s. Also known as ‘Marathon Man’, Morrow is an Australian who travels the world participating in these events while wearing his skin tight blue and yellow suit, replete with flowing red cape. 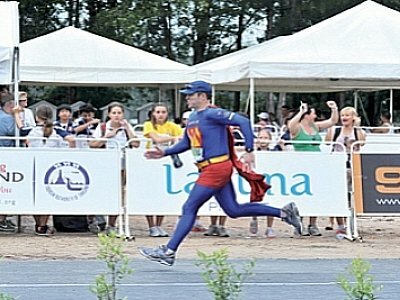 The LPIM marked Morrow’s 50th marathon and the Sydney Superhero was overjoyed at the experience. Morrow races for charity and raises funds for poverty-stricken children in countries in Africa. He is a true superhero, but insists that he is just one person of many who are doing great work. Amongst those friends was Vanessa “Na Chatra” Muangkod, the newly crowned Miss Thailand World winner – a Phuket native. Muangkod led the line for the 5km walk and was full of praise for the event. “It really was a great success. To see so many children in particular turn out for the race and walk was heart-warming,” she said. Danchai Pankong was the first to cross the finish line in the full marathon at a time of 2 hours 49 minutes. Pankong, although exhausted, was elated by his achievement. “I am just happy it’s over” he said, clearly tired but grinning from ear to ear. Klaus Brachetti, a German citizen who participated in the 21km run said he was overwhelmed by the sense of camaraderie at the event. For a full list of race results go to phuketmarathon.com.